Eat plenty of fresh fruits and vegetables. Fruits like oranges, sweet lime (mousambi), grapes are rich in vitamin C. Orange colored vegetables like carrot and pumpkin are high in carotene. Vitamin C and carotene are high in antioxidants that reduce lung swelling and irritation caused by free radicals. People with severe asthma may come up with low vitamin D levels. Milk, egg, fishes like salmon are good in vitamin D. Spending a few minutes outdoors may also help to improve vitamin D levels. Diet low in sodium and high in omega-3-fatty acids (sources- fish oils, nuts) have known to improve asthma symptoms. However, extended studies are required to come to conclusions. Sulphites used in canned/preserved foods, condiments, pickles and other processed foods aggravate irritation. Avoid them. There is no evidence that avoiding milk and milk products will relieve asthma symptoms but can rather cause osteoporosis in people on corticosteroids. Avoid foods that you are allergic to, as they may worsen your asthma exacerbation. In some cases, exercising after eating an allergy-causing food leads to asthma symptoms. A high calorie diet will increase your weight which in turn will worsen your asthma symptoms. Consult a Dietitian to maintain a healthy weight over the long term. 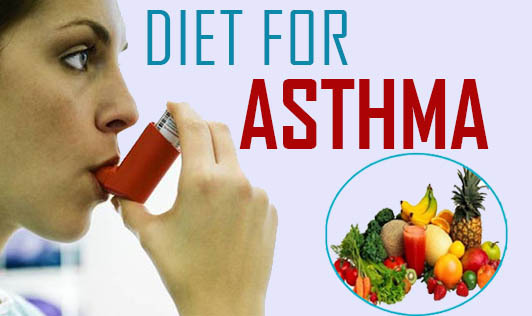 However, regular physical activity, yoga, acupuncture and practicing to inhale more air to reduce fear and anxiety during asthma attack along with a balanced diet will help to keep your asthma under bay.